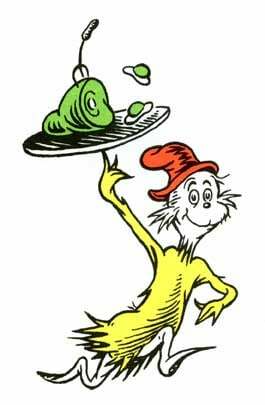 Would YOU Eat Green Eggs and Ham? I would not, could not, in the fog. I could not, would not on a jog. That's very good, Blog! You are so clever! Today is the birthday of Theodore Giesel (aka Dr. Seuss). Help us celebrate by adding your own "Green Eggs and Ham" verse! Or cook something special, from the Green Eggs and Ham Cookbook, by Georgeanne Brennan.